In fine form at Gage life drawing, Shauna gave us pose after dynamic pose that left me marveling at how long she could hold them. 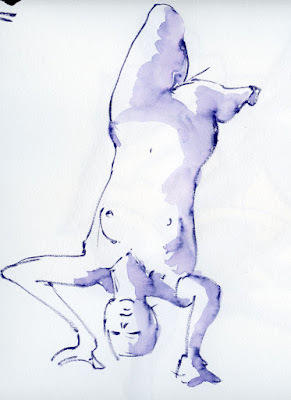 Five minutes bent backward on your head, even when your lower body is supported by a platform, is a long time! 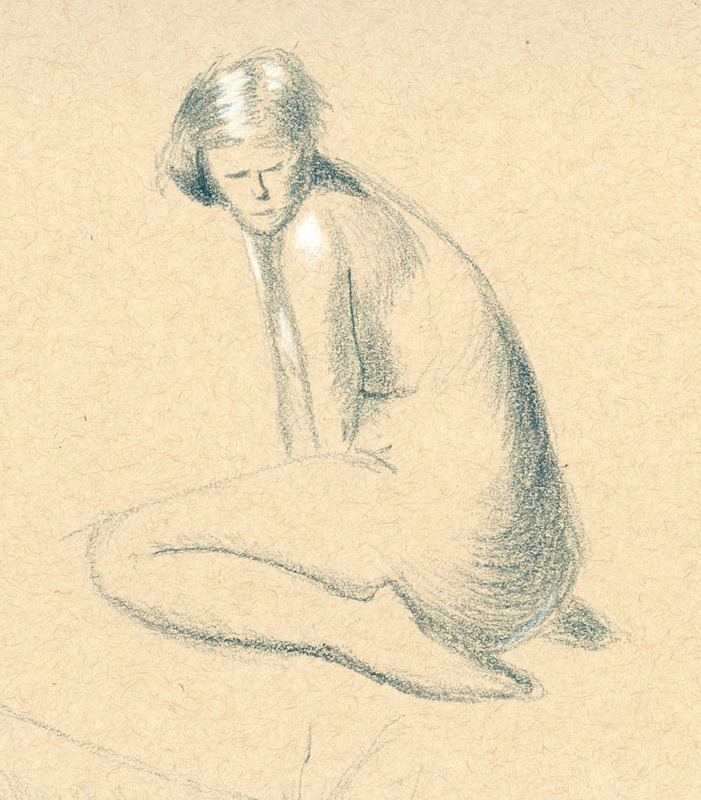 I especially appreciated that pose, though, because it gave me a good workout in capturing her foreshortened leg. I was certainly more exhausted afterwards than she seemed to be. 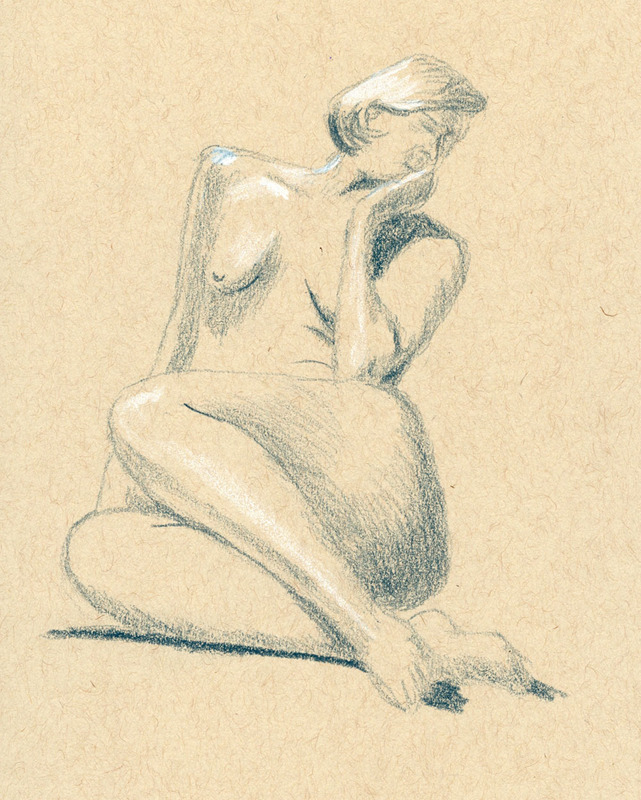 With my summer absence from life drawing and my recent focus on graphite and ballpoint, it had been several months since I last used toned paper there. I’d missed the subtle highlights and form shading I can get with soft colored and white pencils. Those sketches got me thinking about what I want to do for my second annual sketch kit diet this year. During my self-inflicted minimalism challenge last winter, I used a tan Stillman & Birn Nova sketchbook and a small selection of tools that worked well on toned paper. I may do the same again this winter, although I’m also considering an even more extreme minimalism: graphite only! Perhaps alternating the two (not the two simultaneously) would give me some variety. One thing is certain: This year, I am even going to downsize my bag! I got a new Rickshaw Bags Zero Messenger Bag in the “mini” size specifically for this purpose. My “small” size everyday-carry (the purple one shown below) – the size I’ve been using for five years – is ideal when I’m hauling my full arsenal. Last winter when I minimized my kit for the self-challenge, I appreciated how light the bag became, but the temptation to fill the space – and therefore add to the weight again – was too high. The mini-size Rickshaw is in front; behind it is my daily-carry small-size Rickshaw. 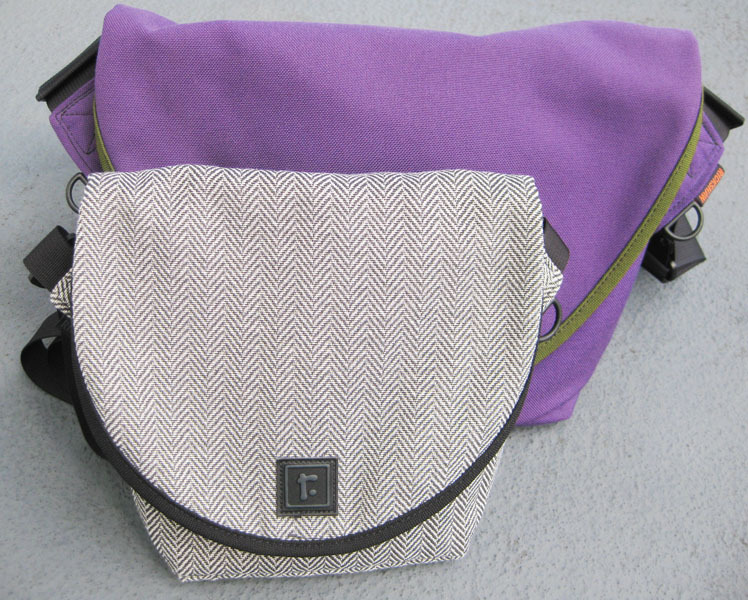 I already have a mini size (shown above) that I use when I travel as a handy way to keep essentials at hand while the rest of my carry-on is stashed under the seat and in the overhead bin. The houndstooth fabric I chose for that one is dressy enough that I’ve even taken the little bag out to dinner on occasion. In the same design and size, the new mini (you’ll see it soon) is made of waterproof material for everyday winter use. Great life sketches both with the pencils and the ink. I like the mini-size Rickshaw. I think the bigger the bag the more we tend to keep putting into it and I know when I do that most of the materials can easily be left behind.